What Use Is a Degree in History? by Vaughn Davis Bornet, BA, MA, Ph.D. The author of this short essay on, well, “career possibilities” for a History Major, has lived a very long Life with high points (Who’s Who in the World), rewards, and vicissitudes. He studied under the best, authored around 16 books, served four plus years in wartime, had a great family, and got kicked around more than a little. A product of Stanford, Emory, and Georgia (Athens), he credits lowly Ida M. Fisher H. S. in Miami Beach for getting him off on “the right foot” in 1935. 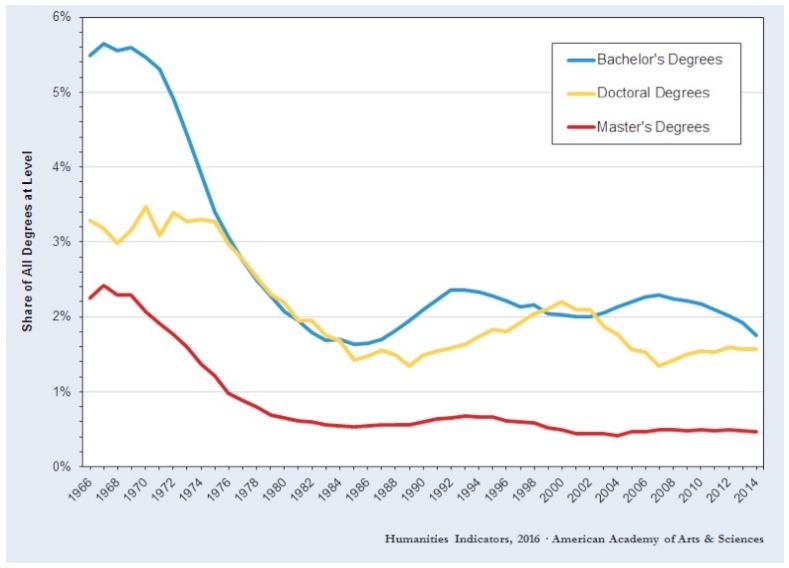 This chart shows history degrees are in decline. One of the reasons is that a lot of people think a history degree is useless unless you’re going to be a teacher. But it’s not true. Teaching is not the only way the History Major can make a living. Let’s ramble about on that remark for a bit. Next time you’re interviewed for some kind of job involving “administration,” tell that person on the other side of the desk that those who have studied History really do make better Administrators than other people. And why not? In all that reading you did there are an infinite number of accounts of good, bad, brilliant, stupid, yes, and important administrations. Vicariously, the History major has the chance to bypass repeating the bad administrations he read about. Why shouldn’t a little boasting be in order when being interviewed? Next, the History major is Literate! It’s a downright rarity these days, everybody is agreeing. It is quite clear that having new employees who are able to read hard prose quickly and then write original prose that advocates, informs, persuades, and/or reveals is an asset to every business out there. Now: in the real world, I earned a very good living repeatedly as an Editor—no, not for a newspaper. There are all kinds of encyclopedias out there. Moreover, inadequate individuals are already in office everywhere, and they pray for an editor to “ghost” for them—and save their skin. Small publishing companies hope that editors on the make will show up to bail them out when manuscripts have to be turned into books in a hurry, somehow always in a hurry. Foundations require of every employee (except the janitor) real literacy coupled with imagination. They need people who can conceptualize, guess intelligently, and put themselves in somebody else’s place—in short, steer big money in the right direction before stupidity strikes. And remember: the law says they have to divest; they can’t just hoard their money; they need to pay out a good deal of it. New Fields of Knowledge keep showing up. They may be comprised of half of this and half of that. These days, though, with all those new gadgets and rapid changes in them, it may be the Method that is new, with the Field of Knowledge old hat. In 1994 I sat down and bought a computer with monitor and tower. Knowing nothing at all about computers, I just telephoned the manufacturer and learned all about the keys whose labels revealed little or nothing to an ignoramus like me. Years earlier, I had taken advance touch typing (and believe I forced my children to do the same). The various military branches need and must have “paperwork” people in all those offices at home and abroad. Join up to be a yeoman (as I did in 1941) and I can almost guarantee you will never hold a gun—or face one. Army, Navy, Air Force: they’re not public enemies but giant organizations that need all the help they can get. Oh. Every government bureau hires highly literate people: the CIA, State, Environment, HEW (or as they now call it: Health and Human Services). Take a long look at what they do. Your Congressman (and Senator) has offices in many a community and needs to staff it with people who spell correctly, ghost for him, and “never foul up.” In our District, an Annapolis man lived in the Congressman’s branch office ten years after retiring! During World War II, with six years of coursework revolving around History, I made a fine Personnel Officer for many months. Ultimately, I followed orders and became probably the Navy’s most powerful Barracks Officer, virtually in “command.” I aced the required courses in “Courts and Boards.” Knowing it to be essential, I developed the tact and diplomacy and literacy in writing and speech the job demanded. Be sure to contact and work with the entire Medical Field if life takes you there. I worked with the headquarters of the American Medical Association for a time, but every state deals with medical matters and with veterans, often in county offices. I know enough about such stuff to believe there is a real shortage of brainy paperwork people in America’s medical bailiwicks. One thing in particular I think I learned over the years as I drifted from Administrator to Professor, to Editor, to Director and back, is that whatever the job in front of you there is a damn good chance that in your hands The Position can be refined, made sophisticated, turned important (to everybody’s surprise), and be made to merit a higher salary scale. “That dumb job” may not stay that way very long. You may not be a subordinate all that long, either. But I do hope you took a couple of Psychology courses. And with luck, maybe you will be treating others with decency, respect, and kindness. Forgive me: While a professor may be able to kick people around (after permanent tenure, that is), the outer world really does reward those who behave themselves. Really liked and rewarded are those few who display some vestige of empathy as they interact with others. Yes, things can be “pretty lousy” out there. You bet! On the other hand, I did find that studying up on “the way things are” often paid off by showing pathways I could take to Change Procedures for the Better. I guess in final summary, I want to say something like this: I’m pleased and proud that You chose to get a History Degree. I’m sorry that some goal you set in employment didn’t turn out quite the way you expected. But I found over long decades that the History major I got was an enormous asset. It definitely helped me as I journeyed usefully through a Pleasing Life.